Giovanni Antonio Magini, who dedicated his life to producing a detailed atlas of Italy, was born on this day in 1555 in Padua. He also devised his own planetary theory consisting of 11 rotating spheres and invented calculating devices to help him work on the geometry of the sphere. Magini was born in Padua and went to study philosophy in Bologna, receiving his doctorate in 1579. He then dedicated himself to astronomy and in 1582 wrote his Ephemerides coelestium motuum, a major treatise on the subject, which was translated into Italian the following year. In 1588 Magini joined in the competition for the chair of mathematics at Bologna University and was chosen over Galileo because he was older and had more moderate views. He held the position for the rest of his life. But his greatest achievement was the preparation of Italia, or the Atlante geografico d’Italia, which was printed posthumously by Magini’s son in 1620. Although Italy as a state has existed only since 1861, the name Italia, referring to the southern part of the peninsula, may go back to the ancient Greeks. It appeared on coins thought to have been produced in the 1st century BC and was eventually applied to the whole of the peninsula. Magini’s atlas set out to include maps of every Italian region with exact names and historical notes. It proved expensive to produce and Magini took on extra posts in order to fund it. These included working as mathematics tutor to the sons of Vincenzo I of Gonzaga, Duke of Mantua. The atlas is dedicated to the duke, who assisted him with the project by arranging for maps of the many states of Italy to be brought to Magini. The governments of Messina and Genoa also assisted him financially to help him produce the atlas. Magini died in Bologna in 1617 and the lunar crater maginus was later named after him. Padua in the Veneto, where Magini was born, is one of the most important centres for art in Italy and home to the country’s second oldest university. Padua has become acknowledged as the birthplace of modern art because of the Scrovegni Chapel, the inside of which is covered with frescoes by Giotto, an artistic genius who was the first to paint people with realistic facial expressions showing emotion. 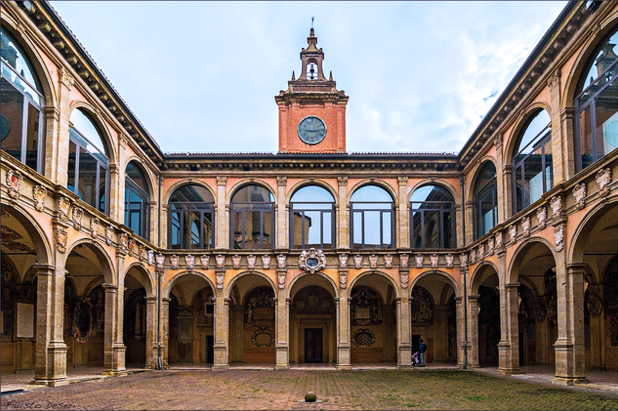 At Palazzo Bo in the centre of the city, where Padua’s university was founded in 1222, you can still see the original lectern used by Galileo and the world’s first anatomy theatre, where dissections were secretly carried out from 1594. 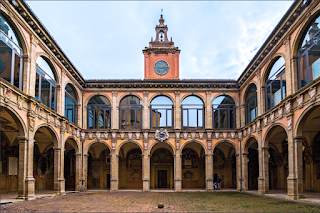 Bologna University, where Magini occupied the chair in Mathematics, was founded in 1088 and is the oldest university in the world. The oldest surviving building, the Archiginnasio, is now a library and is open Monday to Friday from 9 am to 7 pm, and on Saturdays from 9 am to 2 pm. It is a short walk away from Piazza Maggiore and the Basilica di San Petronio in the centre of the city.